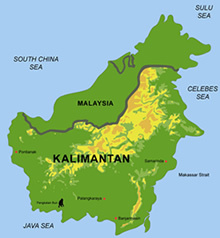 We have flown the Mawas area again in 2011 as in 2007 and additionally an area near Sungai Wain in Kaltim. We have processed the raw LiDAR data to geo-referenced ASCII files, to LAS-files, to DSM and to classified DTM data of the different tracks for DLR, Oberpfaffenhofen. LiDAR Survey on 4.Aug 2011 of the Mawas area crossing the BOS Tuanan station, the MRP-channel and the river Mentangai. This Mawas track we monitored in 2007 too.